Powers/Abilities: This Hobgoblin possesses superhuman strength, the extent of which is unknown, nor the origins of it (though it's possibly from the same formula that gave most of the others theirs). His outfit is fitted with circuitry allowing him to channel and discharge up to 10,000 volts of electricity. He carries a variety of weapons in his pouch, notably "pumpkin bombs" similar to those utilized by other Goblins. His Goblin Glider can reach 90 mph speeds. History: (Secret War#5 (fb) - BTS) - The current wearer of the Hobgoblin costume/armor was either given it or had it upgraded by the Tinkerer, bankrolled by Latverian Prime Minister Lucia von Bardas. (Secret War#3 (fb)) - Hobgoblin and Lady Octopus were sent to attack and kill Captain America. He threw the Hobgoblin's glider into Octopus' face, and the two villains retreated to regroup. 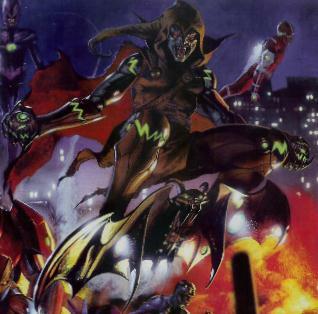 (Secret War#3) - Hobgoblin was among a group of super-villains who ambushed Nick Fury, Captain America, Daredevil, and Spider-Man--all of whom had been involved in Nick Fury's secret war on Latveria. (Secret War#4) - The above battle continued, even after the Fantastic Four arrived to assist the heroes. Eventually a now-cyborg von Bardas showed up and caused all of the villains' armors' energies to join together in a chain reaction that would've caused a massive explosion. (Secret War#5) - The chain reaction was broken up by S.H.I.E.L.D. Agent Daisy Johnson when she killed Lucia von Bardas by blowing her up from the inside. Hobgoblin and all the other villains survived and were taken to hospitals (and after their recovery into the next prison capable to hold them). Comments: Created by Brian Michael Bendis and Gabrielle Dell'Otto. any of the Green Goblin/Hobgoblin doubles, imposters, robots, third cousins twice removed or alternate future counterparts.